Members of the Gallia Academy girls soccer team pose with a banner, following Thursday’s match that sealed the outright league title on Thursday in Centenary, Ohio. CENTENARY, Ohio — They may be beginners, but there was no luck involved. 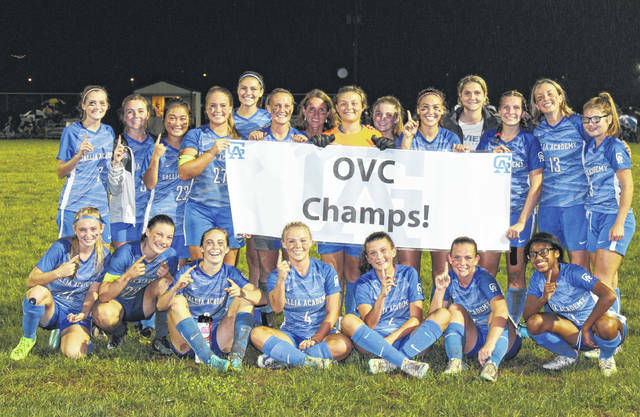 In its inaugural season, the Gallia Academy girls soccer team won the Ohio Valley Conference championship, with the Blue Angels defeating guest South Point by a 7-1 tally on Thursday at Lester Field to seal the title outright. Gallia Academy (11-2-0, 7-0-0 OVC) went ahead 1-0 less than three minutes into play, as Brooke Johnson scored on an assist from Sarah Watts. SPHS (3-5-1 OVC) tied it at one with an Emilee Whitt goal in the 10th minute of the match, on the Lady Pointers’ only shot on goal in the first half. GAHS reestablished the advantage with 23:19 left in the first half, as Megan Bailey scored an unassisted goal. The hosts tacked on one more goal before the midway point, as Watts scored on an assist from Junon Ohmura. Gallia Academy made its lead 4-1 11 minutes into the second half, as Kyrsten Sanders scored an unassisted goal. With 10:23 left, the Blue Angel advantage grew to 5-1, as Preslee Reed scored an unassisted goal. The Blue and White found the back of the net twice in the final four minutes of the match, with Gretchen McConnell scoring on an assist from Reed, and Bailey Burnette scoring on an assist from Gabby McConnell. Following the victory, Gallia Academy head coach Leah Polcyn was proud of all that her team has accomplished in its first campaign. GAHS earned a 3-2 edge in corner kicks, while picking up a 17-to-4 advantage in shots on goal. The Blue Angels also defeated South Point on Sept. 11 in Lawrence County. GAHS hosts Southeastern in non-conference action on Monday and then will travel to Rock Hill to finish league play on Tuesday.